The customer will be responsible for providing us a copy of the current shot records. We accept paper copies as well as faxed copies and email attachments. This form is required for ALL clients wishing to do daycare and boarding at the Fritz kennel. Please download and save this form to your computer, change the file name to your dogs name, fill out completely, and email or bring with your pet on your next visit. Do not hit use the submit form button at the bottom of the form. Please email from your email account. Adobe reader is required to view the form. You can also scan and email it back to us at thefritzkennel@yahoo.com Thank you. 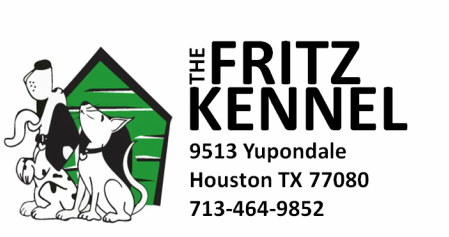 Save this file to your computer and email to thefritzkennel@yahoo.com from your email account. Don't use the submit form button. We do not require you bring your own food for your pet, Although we do prefer that you bring your own food. This provides a certain level of comfort for your pet while away from home. Changing their diet for even a few days may cause problems for their digestive system. If you decide to NOT bring your own food, there is a $1.00 surcharge per feeding. We will feed your pet as much and as often as you tell us. We offer, Kirkland-Premium food.